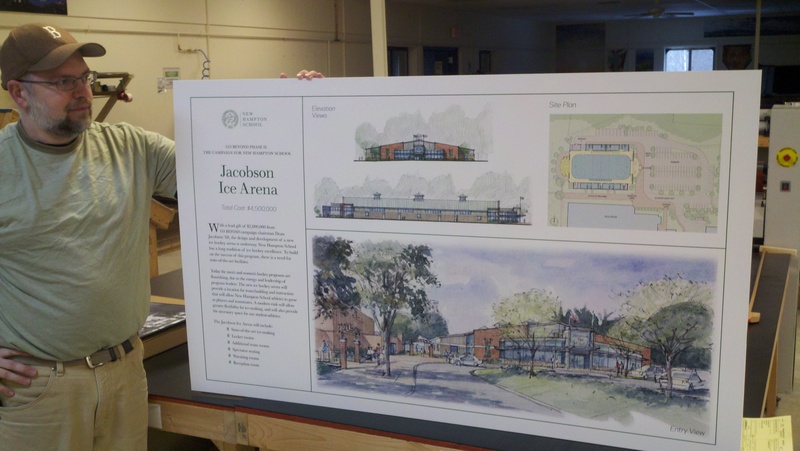 When the New Hampton School wanted to put up fund raising signs showing the plans for their new hockey rink, they came to us. They had beautiful artists renderings of the new facility, and they wanted to put up poster around the existing hockey rink to help them raise money for the new one. In an environment like that, they needed something waterproof and able to withstand a little abuse. We printed with UV curable inks on 1/8″ sintra, a foamed PVC sheet that gives wonderful results. Fund raising requires a little extra effort, and this kind of graphic is classy and effective. Our flatbed printer stays busy doing this kind of work for people all over the country! This entry was posted in Flatbed printing and tagged fund raising signs, sintra signs, waterproof large format printing. Bookmark the permalink.